Water is the one component critical for all life as we know it. Water is responsible for maintaining hydration, controlling body temperature, replacing nutrients throughout our system, and flushing toxins out. The importance of fresh water in our lives cannot be understated, and this is also true for our pets. The amount of water an animal needs varies with its size and activity level. A good general rule of thumb is simply to keep fresh, clean water available at all times. Writing an article dedicated solely to water may seem a stretch to some readers. The fact remains, however, that even though water is a most crucial component to our pets’ health, it is also the most misunderstood. Without fresh clean water daily, their health is in danger. You see, animals not only drink water for hydration and proper bodily functions as we do, they also drink water to clean their mouths. Today, more than ever, we are seeing an increase in bad dental health in pets, which may very well be due to our inability (or unwillingness) to supply them with fresh water daily. In our constant endeavor to find ways of making pet ownership easier, a new way of watering animals has become quite popular. Instead of refilling their bowls at least once a day (and cleaning the water bowl with each refill), many owners have switched to a “water cooler” system, which is far easier for humans! Unfortunately, since our pets do not “drink” like we do, this ever-so-convenient system actually can be, and often is, not very healthy for them. Let me explain. When your dog or cat takes a drink, he first uses the water to rinse and flush out his mouth. Then he lets this water run back out. In the wild, a dog or cat will drink from a fresh running stream. This water is in motion and therefore constantly “oxygenated,” which gives the animal’s mouth a good cleaning while also providing clean water as the expelled dirty water runs downstream. After this rinse, the animal quickly begins to drink. Once we stop emptying and cleaning water bowls daily, bacteria start to grow from the “dirt” the animals have just flushed back—and they now have to drink this same dirty water. Add the possibility of multiple pets drinking from one source, and you can easily see where this is going! So if you’re watering your pet(s) with the upside down water bottle container and only refill it weekly (or, even worse, whenever it empties), your pet is drinking some nasty water that will affect his health. At least once a day, your pet should be offered clean fresh water. 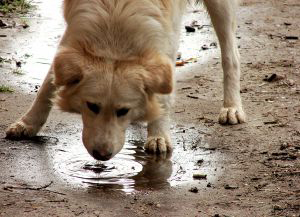 Another water issue relates to “alternate” sources of drinking water that your pet may favor. What about those pool-drinking pups? Whenever you are with your pet, you should discourage this behavior. I don’t believe any pet should be left unattended by a pool, but if your dog is a proficient swimmer and knows how to get out of a pool, then it’s admittedly difficult to keep him from drinking pool water when you’re not around. Finally, pets don’t sweat as we do, and we need to accommodate this difference when our animals are very active. Most of us love to bring Fido along when we are hiking or camping. 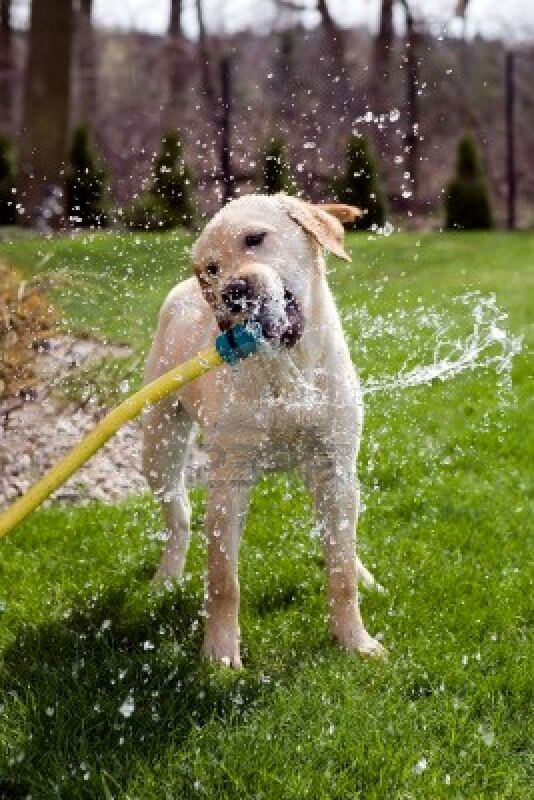 Fido probably enjoys it too, but make sure you always bring plenty of fresh water for him. He will need more than you think, so offer it often. Again, drinking from lakes and ponds is not healthy. Our lakes and streams carry all kinds of parasite and bacteria like Giardia. These bacteria can wreak havoc with your pet’s digestive system. 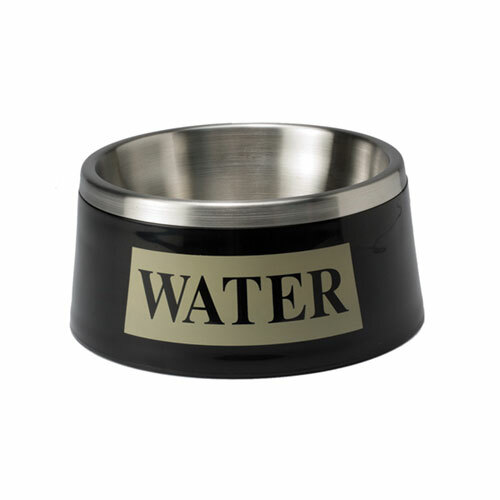 If you think your pet is dehydrated, offer him small amounts of room temperature water. Do not let him gulp. Often, if an animal is dehydrated and drinks very cold water or too much water too fast, he will start vomiting, which only causes him to dehydrate more. It is best to see your veterinarian if you have questions or concerns, or if any of the following symptoms appear: poor skin elasticity, constipation, sunken eyes, increased heart rate, or lethargy. The best part of pet ownership is having our animal companions join us in our daily lives. Just remember to always have a sufficient amount of good clean water available to keep them healthy! easy on the eyes which makes it much more pleasant for me to come here and visit more often. hope talking with you soon. Thank you! I hear you! Procrastination is a killer! Keep at whatever you want to achieve and eventually you will get there! Thanks too for your nice comment. Glad you enjoyed my post!